New services are venturing to transform the way the auto-rickshaw sector is managed in Chennai, India – to the benefit of users. Photo by Matthieu Aubry/Flickr. Chennai, the capital of the Southern Indian state of Tamil Nadu, has long been infamous for the poor quality of its auto-rickshaw services. Until recently, it was best known for delinquent drivers fleecing passengers as they refused to use fare meters. However, a long unmet desire for reliable last-mile connectivity has catalyzed private entrepreneurs to venture into the auto-rickshaw sector. These private entrepreneurs, such as the new Makkal Auto service, have in the past month improved the quality of transport for their own passengers through transparency and smart use of technology. Combined with state government’s reforms aimed at ensuring fair pricing, the hope is that the actions of Makkal Auto and other entrepreneurs will spark a paradigm shift in the efficiency and quality of the city’s auto-rickshaw services. ‘Makkal Auto’ means “people’s auto” in Tamil. While another private auto-rickshaw service with the same name exists in Coimbatore, Mansoor Ali Khan, the founder of Makkal Auto (Chennai) and the co-founder of Namma Auto, believes this is a good thing. A familiar name, he hopes, will bring credibility and an emotional connection with it. 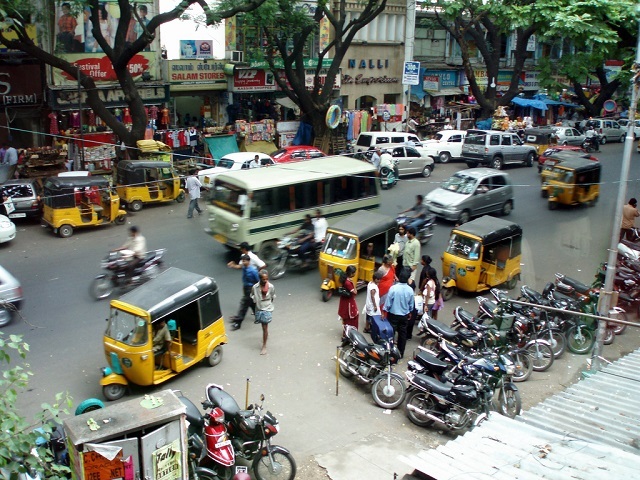 Namma Auto, meaning “our auto” in Tamil, was launched in May 2013 as the first private company providing metered auto-rickshaw services in Chennai. It provides hassle-free, metered rides and allows users to both call to book an auto-rickshaw or flag one down on the roadside. Besides using a digital meter and providing courteous service, Namma Auto rickshaw drivers give printed receipts of the fare to passengers. One unanticipated challenge is that Namma Auto’s strong branding makes it easier for unions and other more scrupulous drivers to stop them from gaining customers at traditional rickshaw stands. This issue has not been formally resolved, but despite lingering tensions, the owners of Namma Auto are learning from such obstacles, and hope to make Makkal Auto a better venture. One of Makkal Auto’s biggest strengths is its use of technology. Each of the rickshaw drivers has a tablet with software developed by Singapore-based company Terratech. The software presents information to the passenger – information about the driver, advertisements for local stores, and in the future possibly documentaries and television series to watch. The tablet also acts as a GPS system, allowing the company’s owners to see where the rickshaws are most needed and monitor the movement of the autos. Since the tablet is a big investment (each one costs INR 20,000 or USD 330), the use of the tablets is being rolled out slowly. The tablet is currently being used in 100 auto-rickshaws, of which 25 are owned directly by Makkal Auto. So far, the technology seems wildly successful, with a list of 800 drivers who are willing to use this meter in their vehicle, and several companies wanting to place their advertisements on the rickshaw’s tablet. 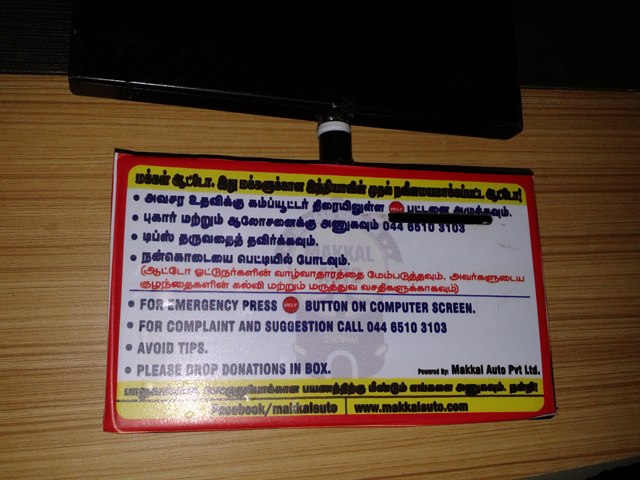 Along with the tablet, Makkal Auto also offers a “help” button. When pressed, it alerts the traffic police control room and the Makkal Auto regional office. Pressing the help button also initiates the camera in the tablet to start recording automatically, providing passengers an extra layer of security. However, since the meter runs on the GPRS (General Packet Radio Service) system, it is necessary that the infrastructure is in place for the tablets to work. Makkal Auto has also started providing cashless payment options to passengers. Currently, this capability is only being used in 15 rickshaws, but it would be surprising if the practice did not expand. Cashless payment gives the company’s owners better tracking of their business, and gives customers less of a reason to carry around large sums of money, and in turn, more security. Makkal Auto’s new auto-rickshaw meters attach tablets, enabling passengers access to GPS and even entertainment during their ride. Photo by Roshan Toshniwal. Makkal Auto has also seen immense success for its female only auto-rickshaw services. Inspired by the Pink auto initiative in Gurgaon, Makkal Auto provides auto rickshaws driven by women to cater to women, children, the elderly, and men accompanying female passengers. Currently, there are 25 trained female drivers in their service. The company helped these women to obtain their driver’s license and also helps them grow their customer base. The company also provides the women auto-rickshaws on a rental basis. In addition to this increased concern for women’s safety, Makkal Auto has placed a central emphasis on courtesy. Makkal Auto’s drivers have been instructed to charge as per the meter, and not ask for tips. If the commuter is happy with the driver’s service, there is an option to leave a tip in a donation box where the passenger sits. This is a more dignified approach, as it creates a more relaxing environment for the user and prompts the driver to deliver better service. Makkal Auto’s strategic use of technology and increased courtesy is likely to be successful, but it is not simply this singular company’s success that is incredible. As Indian citizens recognize how a rickshaw service can be safe, comfortable, and tech-savvy, user’s preferences are likely to force other rickshaw companies to deliver the same calibre of service. By increasing the expectations of auto-rickshaw drivers, and giving the drivers the technological tools to deliver on those expectations, it has the capability to transform the auto-rickshaw sector and significantly improve mobility in Indian cities.